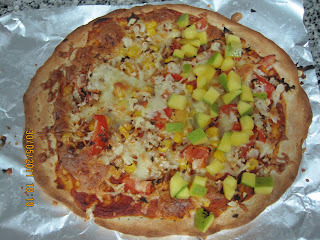 The pizza made was really good. But, there was a constant guilt factor that kept pestering me that it was full of all-purpose flour which is notorious for its not-so-good-for-health status. So, there I was, hitting the "Enter" key on Google Search for a whole wheat based pizza, but could not get my hands on such a good thing. (Or rather, I wanted to try out something on my own). Then, I thought I will modify the recipe from the above given link, so that it was 2 parts whole wheat flour and 1 part all purpose flour. And, there I was in the kitchen, making the healthier pizza. It started as a normal blog with feelings of Interest (That I have to write well), Hesitation (on what to write), Inhibition (What will others think on my writing), Inhibition (that I should not get not-so-good comments) etc... And today, after many years, here I am, with an update to my profile. This blog has taken many turns, by having topics from fancy writing to daily life to recipes and now with updates of my daughter's day-to-day life and her growing up. I am glad I am doing this and I hope it continues so that she has a good laugh on seeing this blog when she grows. For your information, my sweet little daughter has completed 3 years in July 2012, and I will address her as "Kanna" (sometimes) in the blog (a baby-ish slang to address children).